1 What Can One Do with a History Major? 3 Too Many History Majors? What Can One Do with a History Major? Most individuals assume that history majors are destined to teach grade school or high school and that a few who get advanced degrees teach at colleges and universities. In reality, historians practice their craft in museums, libraries, archives, major businesses, consulting firms, and various branches of the federal government, including the military. A large number of history majors find employment outside the profession, where they use their writing, research, and analytical skills in business and social services. Still others use history as a stepping stone to professional graduate programs, such as law. To help students who are interested in a history major but who are unsure about how they will survive in the workplace, I have created a downloadable and printable map titled "Career Options for History Majors." This article will consider not only what one can do with a degree in history but the benefits of studying history, the types of employment history majors find, the salaries for those who study history, and how to explore alternatives to the historical profession. “What are you going to do with that major?” I am sure that every history major (and anyone studying the liberal arts, that is, the social sciences and humanities–history falls into either category) has heard that question from relatives, friends, and acquaintances. Those who decide to study history do so because they find the past magically compelling, and they believe that one can learn from the past. There are other reasons to study history. First, history provides us with a perspective on our past as humans. It gives us insight into human nature, how we relate to each other, how humans interact in groups and societies, and how groups and societies interact with each other. This is important in any age, but it is particularly crucial in today’s global socioeconomic and political environment. For Americans, studying other cultures has special significance. The United States’ economic and military clout dictates that Americans at all levels comprehend relations among states in the international community, in order to make wise decisions at the polls and elsewhere. Additionally, Americans typically have little international exposure before they enter careers or professions. This is partly because of the widespread use of the English language throughout the world, even though most American international business professionals are multilingual. It also is a negative aspect of the legacy of our isolation in the world, the result of our almost insular status. The oceans that separate us from Europe, Asia, and Africa help create in Americans a certain naivete about things non-American, which some Americans confuse as un-American. As the British historian Hugh Brogan (born 1936) stated, Americans do not “understand foreigners and therefore [do not] understand themselves in relation to foreigners.”1 History helps Americans overcome these faults and prepare them for international contacts. Another set of perspectives that studying history provides results from thinking along interdisciplinary lines. History is not just politics or military maneuvers and weaponry. It is an explanation of the political, cultural, social, and economic factors that account for change. For example, an account about the outbreak of a war based on diplomatic and military explanations alone, without considering economics and social trends, is laced with pitfalls. No historian can master all of the fields of study necessary to render a complete account of an event, but that does not prevent him or her from bridging interdisciplinary divides. Second, historians become good at reading scholarly and other serious material. After a series of introductory and upper-level history courses, the history major becomes adept at sorting through the facts of a history text but dissecting the argument in a scholarly article or monograph. They become adept at extracting from documentary material the attitude and intent of an author, in addition to hidden meanings that may appear in a source. Third, historians are adept at finding information in the most unlikely places and selecting the best evidence to construct an argument because of the research they must complete to explain what may seem to be rather obscure topics. In some instances, historians must sort through an abundance of readily available materials to find evidence. At other times, they encounter a dearth of sources on a topic, and they must take unexpected paths to reveal the information they seek. Fourth, as they read and research, historians analyze the material they gather and reach conclusions about an intangible world, since they cannot visit the past. Occasionally, this analysis involves statistics or economic data, while at other times, it may require the careful reading of texts. In any case, historians must interpret the information they find to explain the impact of an individual or an event. With the historians’ aptitude at accounting for past occurrences, they can transfer those abilities to such fields as business and technology. Fifth, good historians must write well, because they have to reach various audiences, and they learn how to edit their works and the products of others. Associated with good writing abilities are good verbal skills, something else that most historians possess. Although there are different writing and speaking styles for various fields, they all involve the basic competencies that a good historian will develop. Together, the first letters of the words writing, analysis, research, and perspective spell warp (with the r serving double duty as reading and research), and according to this version of warp theory, every self-respecting historian is warped. Move over Zefram Cochrane! This all sounds very good, but what can one do with these skills if one does not find employment directly related to history? The abilities to read critically, to research, to analyze situations, often across interdisciplinary lines, and to convey perspectives on problems, in both verbal and written forms, are crucial to any profession, and employers increasingly recognize that these are skills that historians and those in the humanities and social sciences can bring to the workplace. Employers often lament that college graduates are unprepared for the workplace, and well-trained history majors offer them precisely the sorts of critical-thinking skills across various fields that they desire. 1Hugh Brogan, The Pelican History of the United States of America (London: Penguin Books, Penguin Group, 1986), 450. Several authors elaborate on the skills of historians and how they meet the needs of employers. To see how the study of history is useful, see http://www.latimes.com/opinion/op-ed/la-oe-grossman-history-major-in-decline-20160525-snap-story.html. About the critical-thinking skills of the social sciences and humanities that employers desire, see http://chronicle.com/article/College-Students-Think/151289/?cid=at&utm_source=at&utm_medium=en. On the benefits of studying history for those in the STEM fields, read http://chronicle.com/article/To-Understand-Science-Study/144947/?cid=at&utm_source=at&utm_medium=en. In reality, liberal arts majors should take more STEM courses, and those in STEM should learn more about the social sciences and humanities. See https://www.seattletimes.com/opinion/liberal-arts-degree-delivers-liberal-earnings-and-job-satisfaction/. The American Historical Association and various history department also have sources to explore if one is considering a history major, and some suggestions appear below. History departments at universities want to attract students, and in doing so, some provide thoughtful reasons why one would want to major in history. One case is the Rutgers Department of History, which has a web page with five good reasons to study history. Dartmouth’s Department of History website includes a pie chart that illustrates the career choices of 2,282 history majors from their institution between 1972 and 2001. The number of majors in any field fluctuates, depending upon demand and public perception. With the advent of the microprocessor in the 1970s, interest in computer science exploded in the 1980s and 1990s. Still, despite undisputed growth, there have been slumps in the hiring of computer specialists. Even a glut in the market for engineers occurs, particularly when the economy contracts. At times, something other than the job market influences the number of majors in a given field. In the 2010s, conservative politicians made pronouncements about the need for specialists in technology and the sciences, as opposed to those in the impractical social sciences and humanities (one wonders what those same critics would do without art, music, literature, films, and posh decor). Their comments spurred enrollment in STEM majors, while the number of those studying other fields declined. Perhaps the fear our country's leaders instilled in students contributed to a shortage in teachers toward the decade's end. The word cloud above illustrates the careers of those with doctorates in history and is from The Many Careers of History PhDs: A Study of Job Outcomes, Spring 2013. Mention of the study appears in the section below titled "More Information on Earnings and Unemployment Rates of Graduates in History." No discipline can guarantee full employment for its graduates, but some fare better than others. It is a mistake, however, to think that liberal arts majors–historians among them–are unemployable. Those interested in studying history often are concerned with the number of history graduates and a glut in the market of historians. In reality, such fears are unfounded. There always are more individuals who complete history degrees, at all levels, than there are possibilities for employment in the field of history. In fact, most of those who study history at the undergraduate level do not find employment that is directly related to their field of study. It is crucial, then, for history majors not only to excel in their field but to diversify their studies and to think broadly when it comes to employment options. To see trends in the number of majors in the four decades from 1970 to 2011, view the interactive graph from National Public Radio that is part of the article titled “What’s Your Major? : Four Decades of College Degrees, in One Graph.” For the statistics NPR used to build the graph, see the study from the Institute of Education Sciences, National Center for Education Statistics, titled “Bachelor’s Degrees Conferred by Degree-granting Institutions, by Field of Study: Selected Years, 1970-1971 through 2010-2011." Carleton College, a liberal arts institution in Northfield, MN, tracked the career paths of its graduates and created an interactive Sankey diagram to show students the vast potential of their majors. Carleton history graduates, for example, ended up in all the possible professions on the diagram: arts/museums, business/finance/sales, communications/media, education (higher ed), education (pre-K-12), engineering, environment/agriculture, government/public service, healthcare, info systems/technology/library, legal professions, other careers, Peace Corps/AmeriCorps/Teach for America, science/lab research, and social science/advocacy. To explore the possibilities, visit the Carleton College website at https://apps.carleton.edu/career/visualize/. Many students discover, unfortunately after abysmal performance in a few classes, that they lack the interest or aptitude for a particular major. They may switch their major from history to business, journalism, or the sciences. Other students have come from those majors to history after deciding to pursue the course of study they loved the most. Only a few select history because they find it the simplest path for them to get a diploma. Like similar students in other majors, they find it easy to meet the minimum requirements because they have the aptitude to think in their chosen discipline, and they would excel were they to apply themselves. As a result, like any major, within the cohort of those studying history are a variety of individuals: long-term devotees, new arrivals to the field, ambivalent individuals who are considering other alternatives, and a few slackers. There always are some students in every field of study who complete a degree and come to regret their major. Some who find employment in their fields decide afterward that they do not like their profession. I have met a few graduates who received their BA in history only to enter professional programs in completely unrelated fields, such as medicine, architecture, and fine art, as opposed to the more common destinations of postbaccalaureate programs in law, business, and education. A United States Census Bureau study in 2014 also determined that approximately half of those with STEM (science, technology, engineering, and mathematics) majors do not find employment in their respective fields after graduation (view the posting about the study on this website). Furthermore, individuals make dramatic shifts in their careers well after graduating from college. I have encountered many over the years: a marine engineer who became successful in construction sales; a history teacher who now owns a thriving masonry restoration firm; a veterinarian turned artist; a successful career diplomat who received a doctorate in history; a chief structural engineer for a Fortune 500 corporation who left his job to devote all his time to his lucrative Amway consumer products distribution business; a tenured English professor who became an electrical contractor; a banker who bought a concrete ready-mix company; and a chef who became a banker before moving into outside sales. There also are a number of students in graduate classes with careers in other fields but who have begun pursuing their interest in another, including history. There also are students in every discipline who have minors or even double majors for one of two reasons. First, some wish to gain another perspective on their chosen field of study (a popular combination is history and political science as is English and drama or biology and chemistry) to better prepare them for graduate studies and their chosen career. Second, others want to hedge their bets should they decide to abandon the pursuit of their preferred profession, in order to enter the employment market. These students select as a minor or second major a field that promises greater prospects for employment, such as business, journalism, marketing, or computer science. Those who have double majors may not have the luxury of exploring a number of disciplines as those who have minors and room for additional electives, but a 2012 study by professors at Vanderbilt University suggests that double majors have more of the critical thinking and integrative thinking skills that employers desire. Interdisciplinary training and thinking–vital to any position–heightens an individual’s ability to solve problems, using a multitude of tools, and to provide solutions, based on more than one specialization. A study by the United States Bureau of Labor Statistics indicates that baby boomers changed jobs 11 times between the ages of 18 and 44. The trend likely will remain the same for Generation X, Generation Y, Generation Z, baby boomlets, and future generations. Furthermore, many claim that Americans change careers from three to seven times, but proof is lacking. The BLS does not track careers because they are so hard to define. According to an article by Carl Bialik in the Wall Street Journal, titled “Seven Careers in a Lifetime? Think Twice, Researchers Say,” researchers are convinced that seven times is too high a number. Nevertheless, the consensus of employment professionals and the majority of Americans is clear: career change is a reality. That simple fact provides more evidence that students should not view colleges and universities as vocational schools. A minor or a double major that provides one with what one might consider a practical or marketable skill is one alternative, but there is evidence suggesting that one or two courses, even informal ones, like MOOKs, or simple on-the-job training, in certain areas, may expand the job opportunities and salary expectations of someone with a social sciences or humanities degree. After evaluating nearly 955,000 employment advertisements throughout the entire United States for 2012-2013, Burning Glass Technologies, a job market analytics firm, determined that employers look for social science and humanities majors with one or more specific additional abilities: IT networking and support, sales, general business, data analysis and management, social media, computer programming, graphic design, or marketing. 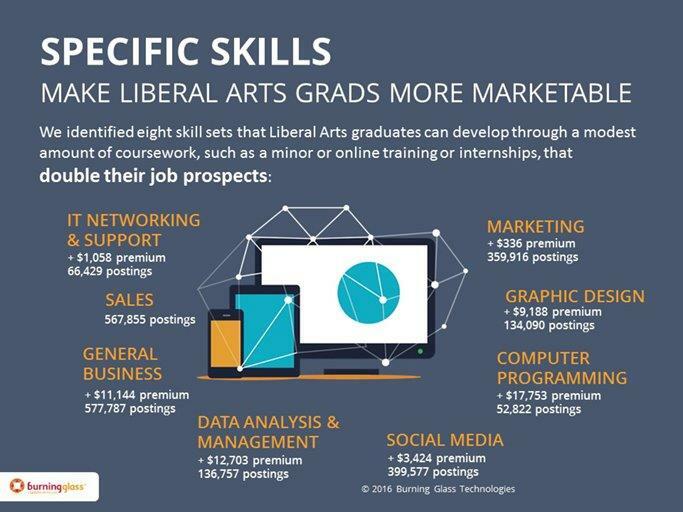 With one or a combination of these skills, an individual with a liberal arts degree can increase the number of potential jobs by an additional 862,000. Furthermore, the practical skills bring recent graduates a boost in salary–$6,000 on the average. Some, like computer programming, bring more, and only experience in sales offers no additional premium. For more information about the data from Burning Glass Technologies, see the following web sites: http://burning-glass.com/specific-skills-make-liberal-arts-graduates-more-marketable/; http://burning-glass.com/research/liberal-arts/; http://chronicle.com/img/photos/biz/liberal-arts-skills_683x512.jpeg; http://burning-glass.com/wp-content/uploads/BGTReportLiberalArts.pdf; https://www.insidehighered.com/views/2016/02/08/debate-over-liberal-arts-vs-vocationalism-lazy-one-essay; and http://chronicle.com/article/Liberal-Arts-Majors-Have/236749?cid=trend_au&elqTrackId=3aaee16df85c4b7992d3a23dc44d739b&elq=b6451a9a3eb74ce19bb3f75d8fefbc2e&elqaid=9431&elqat=1&elqCampaignId=3331. In the event that one decides to change his or her major or profession, it is essential to become informed about career alternatives. One of the best ways to learn about employment in other fields is to talk to people about their careers and what preparation they had not only to land their job but to excel at it. As a part of one’s day-to-day conversation, asking about people’s employment can result in a great deal of information. After all, people love to talk about themselves. Combine this informal research with information gleaned from the seemingly infinite number of career guides. Additional sources of information come from the United States Department of Labor, Bureau of Labor Statistics, which releases the yearly Occupational Outlook Handbook. This and other BLS publications explain the training, working conditions, advancement, earnings, and job prospects for specific professions. For information about how much various majors can expect to earn in different types of professions, review the other information from the United States Census Bureau. One of the resources on the USCB web page is the “Occupation Finder” that describes a profession’s training requirements, job outlook, responsibilities, and salary range. Career centers at colleges and universities offer advice to students and often have web pages with valuable information. An excellent web site is "Researching Careers and Majors" at Glendale Community College. Another important source of information about careers is in the “Life” section of the Wall Street Journal. Those majoring in history must remember that many individuals complete majors in the humanities and social sciences and acquire meaningful employment with fantastic opportunities for advancement in quite unusual fields. Sometimes, these newly minted graduates have some prior experience that helps them make the transition, but that is not always the case (that was true with me when I entered the construction industry, where I remained for eight years). Randall Stross, who completed a doctorate in Chinese history and now is a professor of business at San Jose State University, wrote A Practical Education: Why Liberal Arts Majors Make Great Employees (Redwood Press, Stanford University Press, 2017) that specifically covers these sorts of career changes. Anyone leaving their major or contemplating a career change should take solace in the fact that every course of study at the college level sharpens one’s critical thinking ability and that each major provides students with a particular set of marketable skills. Another key to a successful and stress-free transition to a new field, whether it is while an individual is in college or after they have earned a degree, is to be aware of career alternatives that are not only profitable but also are enjoyable, challenging, and commensurate with one’s talents. In 2011, a significant study emerged from Georgetown University’s Center on Education and the Workforce titled What’s It Worth: The Value of College Majors that contains crucial information for those majoring in history. Engineers are the highest paid professionals, receiving an average salary of $75,000 per year, with bachelor’s degrees, and $99,000, with graduate degrees. Of all engineers, the best salaries are those of the petroleum engineers, who command $120,000 per year. Those who finish their undergraduate degrees as historians make $57,000 if they are American historians and $50,000 if they have other specialties. There are no statistics for historians with graduate degrees, although the study reports that 46 percent of those who study history obtain a postbaccalaureate degree. The study placed historians in the broad category of liberal arts and humanities, and historians with bachelor’s degrees do better than the average for that category, which is $47,000. Those who receive graduate degrees in the liberal arts and humanities can expect an average salary of $65,000. The study provides evidence about what historians do with their majors, information that will cause students in history classes as well as the professors who teach them to give serious consideration to the particular mix of skills historians develop. Most assume that history majors end up in education, but that is true only for a mere 15 percent of graduates. The other top four fields are finance (14 percent), retail (10 percent), public administration (10 percent), and professional services (9 percent). There is no information about the professions of the remaining roughly 42 percent of the graduates or whether they use their degrees in history as a basis for entering graduate and professional programs in other fields. As far as occupations are concerned, 18 percent are in management, 16 percent are in sales, 15 percent are in office work, 11 percent are in education, and 6 percent are in business. The hard numbers of the study are encouraging to history majors who are at a loss to say what they will do with their degree, although it is disappointing to see the premium society places on technology and those careers that produce tangible profits. History majors also can be relieved that their salary is not at the bottom of the heap, where one finds community services and counseling as well as early childhood education. Ironically, those professions with the lowest pay are areas which, given higher salaries that would attract an even greater number of talented individuals, could do the most for society. The study also does not measure job satisfaction and does not ask such questions as how many engineers would have preferred to study history or music but felt compelled to select a major that promises lucrative employment. Information about the study, along with links to the report and a summary are here. The summary is here. Additional information on the earnings of history majors comes from the “Humanities Indicators” of the American Academy of Arts and Sciences’ (AAAS), based on the 2015 American Community Survey (ACS) from the United States Census Bureau. The AAAS determined that those with history undergraduate majors earned a higher salary (slightly less than $60,000 per year) than those who had certain other majors in the humanities. Women’s salaries were lower than those of their male counterparts by about $10,000, and the gap was greater in history than in some other fields of the humanities. The AAAS study found that a graduate degree in history, as opposed to one, for example, in area studies, commanded a much greater salary of $80,000. Using the data from the 2012 American Community Survey (ACS) of the United States Census Bureau that became available in 2014, a study from the Brookings Institution’s Hamilton Project titled “Major Decisions: What Graduates Earn Over Their Lifetimes” concluded that those with undergraduate degrees in history made less than those with degrees in other fields of the humanities. The seemingly contradictory findings likely resulted from the fact that the Hamilton Project study did not differentiate between American and non-American concentrations. The salaries of those with history majors peaked at about 20 years into their careers (those with other majors peaked about five years later), but those who studied history made about $10,000 less than others. In short, the material benefits of a history degree seem to come later in life, and graduate degrees are especially helpful. While history has recently appeared on lists of low-paying majors, usually based on crowdsourced information, and while these lists have sometimes gone viral, analyses based on the broad and authoritative American Community Survey paint a more complete and hopeful picture. While no one should expect to be catapulted into wealth because of a degree in history, neither is the degree a certain path to penury and underemployment. In its statistics that cover 2013-2014, the website PayScale, which builds its data from information that millions of individuals supply about themselves, ranks history at 60 out of 129, in a tie with business administration. Those studying business have a slightly higher salary in the beginning of their careers, but they are tied at $71,000 in mid-career. Those majoring in English actually have a slightly higher mid-career salary. Unfortunately, only the overview is available because PayScale updates its statistics each year. According to the 2018 study, however, history is ranked at 239 out of 489 majors, and there now are categories for European history (ranked 168), history and politics (ranked 173), history and political science (ranked 284 and tied with urban planning), English and history (ranked 312), and American history (ranked 318). The survey includes art history (ranked 363), which does not normally fall into the category of history. The early career salary for the general category of history is $42,200, and the mid-career salary is $75,700. Those fields with higher rankings receive higher salaries, while the inverse applies to the lower rankings. For the latest rankings, click here. In early 2012, the Center on Education and the Workforce at Georgetown University reported on the earning potential and unemployment rates of college graduates in Hard Times. Although the study focused on the period of 2009-2010, when there was high unemployment in all fields, there are important conclusions to draw with respect to the humanities and liberal arts as well as the social sciences. The three fields with the highest earnings for those who had graduate degrees were engineering, computing and mathematics, and sciences. Those with the highest earning potential with bachelors degrees and some experience were in engineering, computers and mathematics, and architecture. Recent graduates earning the largest salaries studied engineering, computers and mathematics, and business. The lowest unemployment rates were in education and health, but education was one of the lowest paid fields, along with the arts. With the stagnant economy at the time of the survey, it is not surprising that architecture had the highest unemployment rates–worse than inexperienced graduates in education, health, communication, psychology and social work, business, and engineering. The Georgetown University study included history in the humanities and liberal arts. The unemployment rate for recent college graduates with history degrees was 10.2 percent, which was higher than the 9.4 percent average in the humanities and liberal arts. With experience, however, the rate dropped to 5.8 percent, which was better than the 6.1 percent rate in the category as a whole. Those with graduate degrees in history had an unemployment rate of 3.9 percent, which was the same as the average for all majors in the humanities and liberal arts. A recent graduate with a history degree expected to make $32,000, which was $1,000 more than the average starting salary in the humanities and liberal arts. A history major with experience made approximately $54,000 per year, which was typical for someone in the humanities and liberal arts. Finally, a graduate degree in history earned $75,000, which was $10,000 more than what those with graduate degrees in the humanities and liberal arts expected to earn. For students interested in history and social sciences, the news that their earning potential was on a par with other fields, like education, psychology and social work, recreation, and arts, is reassuring. Similarly, it is helpful to know that humanities and liberal arts as well as social sciences had better employment rates than the arts and architecture, thanks to the poor economic climate, and were competitive with most other fields. The American Historical Association commissioned a study to survey history doctoral students who completed their degrees between 1998 and 2009 titled The Many Careers of History PhDs: A Study of Job Outcomes, Spring 2013. Approximately 53 percent of those with doctorate degrees had tenure-track positions in community colleges and in four-year institutions, while 17 percent were teaching in higher education without tenure, a percentage that includes adjunct instructors, whose salaries are notoriously poor. Slightly more than 24 percent found employment in other areas. That last category includes primary and high school teachers, librarians, public historians, researchers, government employees, academic administrators, independent scholars, and those working for nonprofits and in the field of publishing and editing. Also in this category is the relatively small group of 3 percent who found work in the business world. A summary of the report is available here. Another AHA survey, “Where Historians Work: An Interactive Database of History PhD Career Outcomes,” polled 30 history departments that granted doctorates between 2004 and 2013 to determine the type of employments their graduates found. While most (53.02 percent) had tenure-track teaching positions at four-year colleges and many (12.71 percent) had non-tenure-track teaching positions at four-year colleges, smaller percentages were instructors at two-year institutions (3.38 percent combined for both tenure-track and non-tenure-track positions), administrators and staff at higher-education institutions (5.26 percent), and research historians at institutions of higher learning (3.26 percent). The remaining graduates were employed at nonprofits, businesses, and government agencies, or they were self-employed. Small percentages were retired, deceased, or students in other programs. Only 0.68 percent were unemployed, and 5.60 percent were not found. Part of compensation includes quality of life, an indicator of which is location. "The Geography of History PhDs," a study from 2018 that is an offshoot of the AHA's "Where Historians Work" (see the paragraph above), tracked where in America those with doctorates in history live. It determined that most are on the East Coast, particularly in the Mid-Atlantic states and New England, and that there is a lesser concentration of those with a history PhD on the West Coast, mainly around Los Angeles and the Bay Area. The vast majority of historians with doctorates live in the eastern half of the United States (roughly east of the 100th meridian). The five states with the largest number of PhDs in history are, in descending order, California, New York, Texas, Massachusetts, and Pennsylvania. The District of Columbia, which the authors treated as a state, is sixth. In 2018, the AAAS released “The State of the Humanities 2018: Graduates in the Workforce and Beyond,” a report in its “Humanities Indicators” series, which sheds a positive light on those who study the humanities, even if they find employment in fields that do not correspond directly to their majors. The study reveals important information about earnings, unemployment, correlation between major and field of employment, and job satisfaction. The authors of the report concluded that “the evidence shows that humanities graduates earn less and have slightly higher levels of unemployment relative to science and engineering majors. With respect to perceived well-being, however, humanities majors are quite similar to graduates from other fields. The data cannot explain the disparity between the objective and subjective measures, but they should provide a starting point for a more nuanced discussion about the relationship between field of undergraduate study, employment, and quality of life” (page 3). The study is essential reading for anyone who questions whether they should compromise their love for the humanities for the sake of a seemingly more practical, job-oriented field in business, the sciences, or engineering. Another positive picture emerges from a study by the National Association of Colleges and Employers (NACE) titled “First Destinations for the College Class of 2016” (released in October 2017). Upon graduation, 53.4 percent of those with a bachelor’s degree had a full-time standard job, with an average salary of $49,525 (p. 6). The average for the humanities and social sciences was not that far off the mark: 47.2 percent had full-time employment, and their salary was $46,970 (p. 43). However, a larger percentage of those in the social sciences and humanities was continuing their education or expecting to do so than, for example, those in engineering (compare p. 32). Apparently, the job market for those in the social sciences and humanities is not so dismal as one might suspect. The gloomy side is that employment possibilities and starting salaries for everyone were down from 2015, and the humanities faired somewhat worse than the sciences and social sciences (p. 4). The report also contains statistics for those receiving associate, masters, and doctoral degrees. In 2018, the University of Texas System released its SeekUT salary tool for students of different majors completing degrees at its various campuses. At the national level, an undergraduate who majored in history at the University of Texas at Austin may expect to have a median salary of $38,609 in the first year, $50,856 in the fifth year, and $65,753 in the tenth year. At the national level, a graduate with a master’s degree from the same institution can expect to make $26,585 in the first year, $53,358 in the second year, and $64,865 in the tenth year. Because the data for the study is based on the experiences of graduates from Texas institutions, the information may not be as universally applicable as some of the national studies. Furthermore, the data is spotty, depending on the school and the selected category of major. Nevertheless, the site still is worth exploring. English majors, like historians, fear uninteresting and low-paying jobs, but once again, the reality is that many English majors have rewarding careers and receive very good salaries. For the perspective of the English major , see the article by Paul T. Corrigan in the 2 July 2018 edition of the Chronicle of Higher Education. Whether a student is interested in gaining admission to a graduate school, entering a professional program, or seeking employment after graduation, a resume is an essential item. Even if a position does not require a resume, preparing one can facilitate the process of completing forms, writing application letters, and preparing for interviews. There is an entire business built around helping people construct impressive and convincing resumes, and much of the advice these so-called professionals provide is useless or even harmful to the interests of the person who needs the resume (always check the credentials and references of professionals). Certainly, a historian, whose training involves considering the career trajectories of famous and not-so-famous individuals of the past, can be sufficiently introspective and objective to write an effective resume. The assistance of a professional may not be necessary, but the opinions of others with experience in all sorts of work environments may be useful. The first thing to remember is that nobody can write a good resume in a short period of time. As a result, it is best to construct one gradually, over the course of weeks, months, or even longer. This way, one can think about how to format the information on the page, how to present specific items, and how to make the reader notice the resume. Create one resume that is extremely detailed and lists all one’s accomplishments, and draw from that resume to craft shorter ones that target specific employers or academic programs. There are some things that should never appear on a resume and a few things that are not advisable. Do not use fancy type faces, clip art, brightly color paper, or colored ink. No resume should contain personal information, such as a birth date, social security number, religious affiliation, race, ethnicity, political party, marital status, or sexual orientation. Do not invest any time into drafting career goal statements, most of which are simplistic, self-evident, or posses some other trait to make the reader snicker. Avoid numbers and bullets, both of which clutter the page and distract the reader. When planning the layout of the resume, think traditionally. Use one-inch margins and a standard type face, such as Times New Roman. Keep the point size for content at 12 point, but 14-point type or bold type will make subheadings easy to see. Use a 25lb cotton fiber paper that is bright white, although a soft, neutral pastel may be appropriate. Construct a heading that contains all of the necessary coordinates, including one’s preferred e-mail address and mobile phone. Indent the content one-half inch to the left of any subheading, and consider using hanging indents where appropriate. These sorts of formatting techniques demonstrate one’s mastery of a word-processing program. Do not be concerned about a resume that goes beyond one page or even slightly more, but be careful about providing too much extraneous information. Decision makers spend only seconds on their first review of a resume and will find unnecessary detail annoying. If the resume extends on more than one page, staple it in the upper left-hand corner. Do not print on both sides of the paper. Determining what should be in a resume is not as simple as one might expect. The education section that appears after the heading should contain, in reverse chronology, information about one’s high school and university, including degrees, graduation dates, honors, and awards as well as majors, minors, certificates, and the like. Include the names of institutions attended, even if they only account for one or two courses toward a degree. Be sure to list any noncredit courses, special training that led to certificates, and badges from on-line courses. A resume that accompanies an application to a graduate program might include a list of courses taken each semester and the title of any research papers associated with a course. The complete names for courses can assist a reviewer who sees a series of abbreviations on a transcript that are not always clear or may not convey the content of a particular course, such as “Overseas Studies,” “ECE before 1815,” or “Dir. Read.” Include school-related activities, along with the length of time one was involved in an organization. The employment history should be in reverse chronology and contain the complete name and address of employers, contact names, dates of employment, titles of positions, and brief descriptions of each position’s responsibilities. Provide a full citation for any publications, using the Chicago Manual of Style. Add any foreign language abilities and a self-assessment of the level of proficiency (see “Studying Foreign Languages” on this web site). Include any foreign travel, providing the length of time abroad, and state the purpose of the journey, even if it was tourism. One might consider adding any extensive travel in the United States. Volunteer work can give a potential employer or an admissions committee an understanding of the commitment of an individual and their sense of responsibility, so add any significant volunteer activity, using a format that mirrors the employment section. Specify memberships in any professional or other types of organizations (it may be appropriate to combine the membership and volunteer lists). Identify one’s favorite hobbies to give the reader a glimpse into an individual’s personality. Hobbies are not essential for a resume, but they likely will do no harm and may result in one’s resume being pulled from the bottom of the pile if an item on the list strikes a sympathetic chord with the reader. Finally, some resumes contain the names and contacts for three or four references. For academic applications, provide the names of professors who know and respect your work, who have taught courses in your field of interest, and who have earned the respect of their peers. For nonacademic applications, use a mix of academic and employment contacts. Always request permission from an individual to use their name as a reference. Proofread with care. Use a word processing program’s spell and grammar checker, but never let the computer make automatic corrections. Print out the final product and proofread the printed version. Give copies to others for them to proofread and to provide additional suggestions. Think carefully about the delivery of any printed application materials. Never send a resume without a well-written cover letter, and always print the cover letter on the same paper stock as the resume. Never fold the cover letter and resume because the creased paper is irritating to the reader. When placing the material in the mail, use a 9" X 12" envelope, which does not need to match the resume paper. Selecting a major is the process of finding the intersection of one’s skills, interests, and lifestyle goals, but the student cannot ignore the realities of the job market. The choice may be difficult, especially given the constant pressure on college students to “do something practical,” as many say. When I sought employment after completing a master’s degree in history, in the middle of the 1970s, my mother-in-law encouraged me to return to school to get “a trade to fall back on” after having completed what she had considered a nonprofitable major. She was sincere in offering her advice and was not in the least condescending, and for a while, I thought she might be right. In the end, I discovered that the seemingly useless major of history served me extremely well in the business world. More than 40 years later, perceptions about majors have changed little, with the current push being on the STEM fields of science, technology, engineering, and mathematics. An article by the writer Virginia Postrel, “How Art History Majors Power the U.S. Economy,” for Bloomberg.com puts the issue of majors into perspective and offers encouragement to those who are inclined to study the social sciences and humanities. She notes, from her own experience, that “whether you learn how to learn is more a question of how fundamental and rigorous your education is than of what specific subject you study.” Learning how to learn, after all, is the greatest skill that anyone can have in the workplace. In 2012, Dr. Kit, who maintains a web site dedicated to student success, interviewed several University of West Florida students to determine why they decided to major in history and public history. Their interviews on Youtube provide more insight into why a student should consider studying history. Dr. Kit’s web site is http://www.drkit.org/, and the interviews are at http://www.drkit.org/history/.